If you've been to Mt. Rainier's Nisqually entrance before then you'll know the majority of the route already. Roughly two miles after passing the small town of Ashford (which is your last stop for restrooms and food) look for the Kernahan Rd E/NF-52 intersection and make a right. From here you'll be on forest roads the rest of the way. We've mapped out two route options at this point. We took route one up and route two down. Both routes are roughly the same distance and contain mostly dirt road with small to medium sized potholes. Route two does have more paved road than route one and it may not be as confusing as route one. Any type of vehicle will be suitable for both. 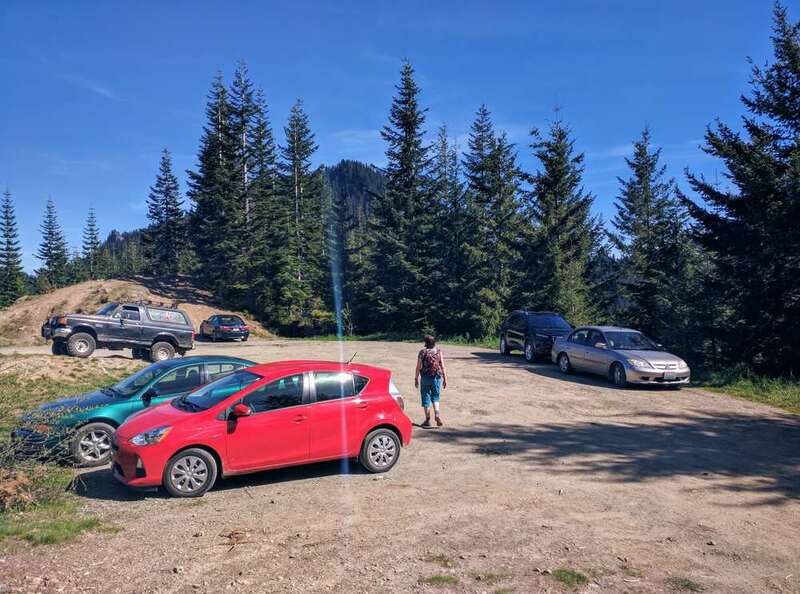 Once you've reached the trailhead you can either park in the lot or along the side of the road. It was a busy Saturday when we went and the lot was mostly full. Once we returned it was pretty empty. On the drive in we noticed a sign which we thought mentioned the need to display a parking pass anywhere you park within the forest. However, according to the Forest Service website, no pass is required for this area. We intended to display ours just to be safe but we actually forgot to. All was good as there was no ticket upon returning. You'll want to bring plenty of water for this. Even though it's only 3.2 miles round-trip, the elevation gain is 1,365'. Not to mention it was a clear, sunny day in the upper 80s to lower 90s. The fir and hemlock did a great job of keeping us shaded during the hike, but once at the top were on a large, open area of rock. 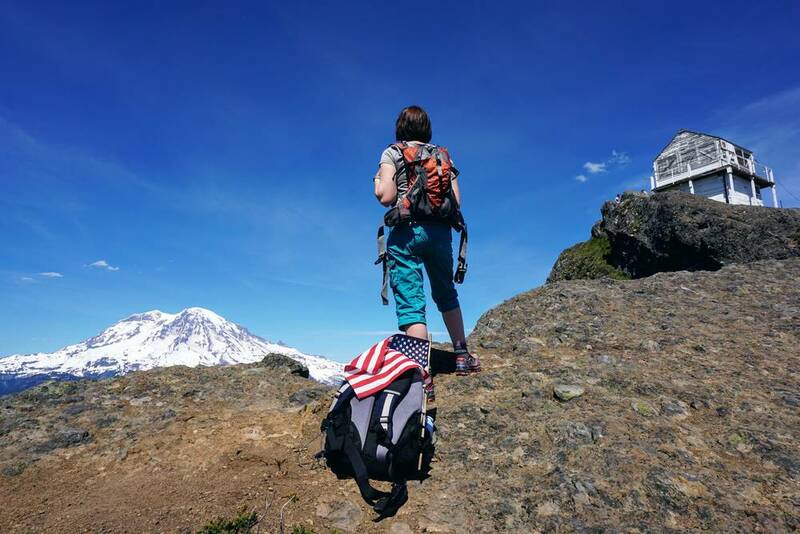 You may want to bring along a good sun hat, depending on how much time you spend at the top. As mentioned earlier, there were plenty of people already up here once we started out. Quite a few passed us coming down, while others passed us while going up. Keep an eye out for trillium, avalanche lily, and more. There are a few minor obstacles to pass around, over, or under. All being downed trees. In one section, doing their best to remove most of what had fallen, there was a very heavy scent of pine in the air. It was a refreshing aroma that momentarily took our minds off the steep climb. And steep it is. There are very few spots along the trail where it is not. Thankfully there are two different spots with a bench at each to take a short break. If the benches are already occupied there's nothing wrong with sitting on a log, which we did a couple times. As you get closer to the top you'll come across a brief opening to your right. It's a rocky surface that provides clear views toward the east and southeast, being able to see Mt. Adams off in the distance. Continue a bit further and another opening in the trees to the right again will present you with the lookout high above. You're almost there! The last portion of the trail may be the steepest. It's short, but knowing that you're almost there should give you a little extra motivation to make it quickly to the rock. Now, say hello to open skies, forest forever, and Mt. 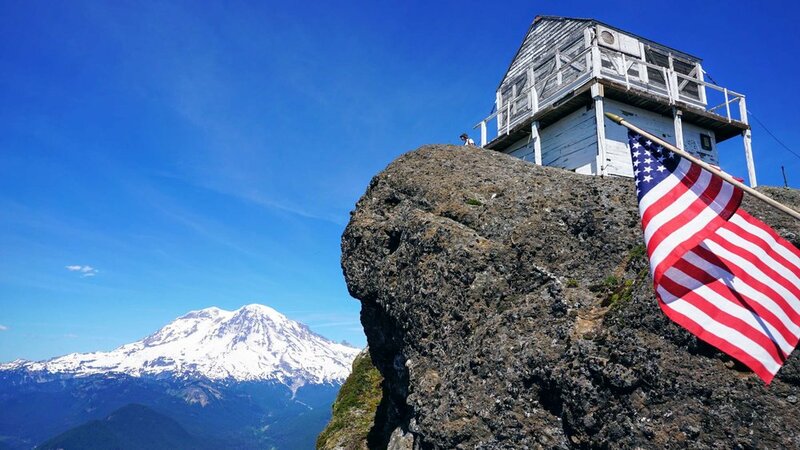 Rainier staring you right in the face! You also have excellent views of Mt. 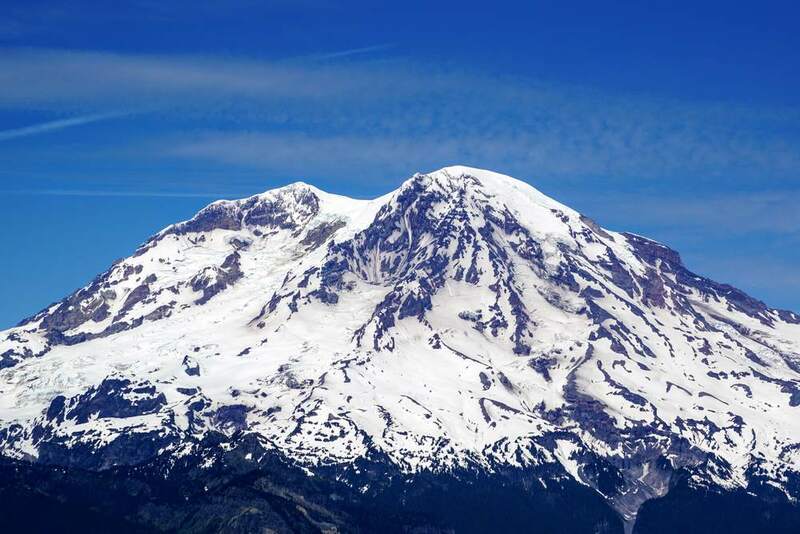 Saint Helens' lava dome, glacier covered Mt. Adams, the sheer cliffs of Sawtooth Ridge, and if it's clear enough, you can barely make out Mt. Hood south of you and the Olympics northwest of you. There's also Alder Lake and the closer Cora Lake. You really need to plan this out so you visit on a clear day. The prominent landmarks are Mt. Rainier and Sawtooth Ridge. 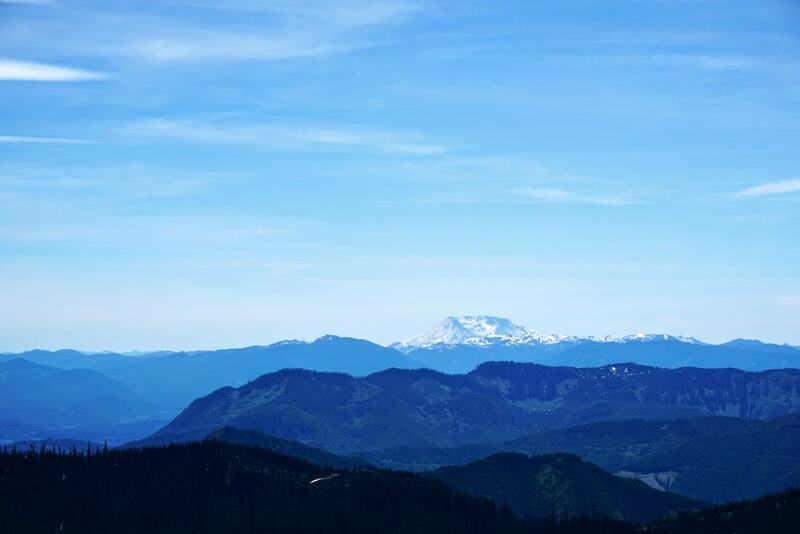 Rainier looks magnificent from here! It's like an enormous widescreen, 4K view, but in real life. Yeah, that doesn't make much sense, but not sure how else to explain it. We tried to spot the Paradise Visitors Center but we believe it was obstructed by the Wahpenayo Peak mountain range. Almost. 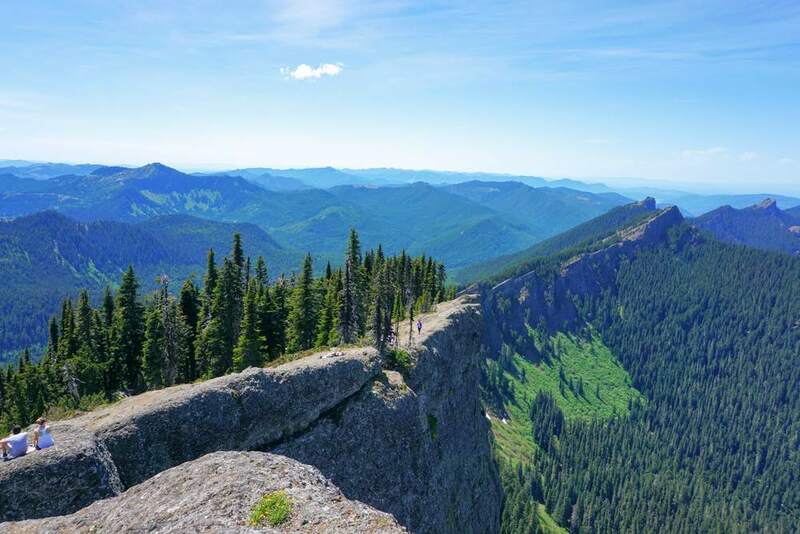 Sawtooth Ridge is easily distinguishable off to the west with its jagged, rocky topped ridge line and sheer cliffs to the north. It rises above all the surrounding mountains in the area, making it a perfect focal point for photographers. 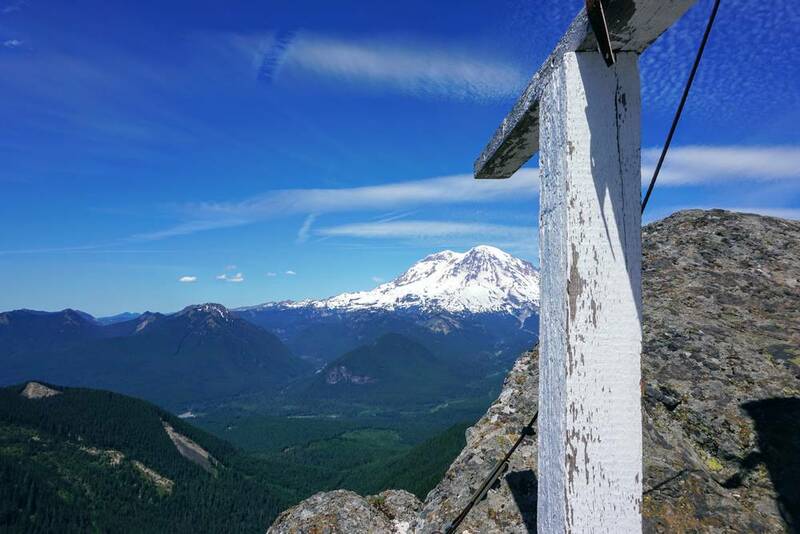 At one time there were guide cables along the portion next to the lookout in order to keep you safe, but those have since been removed, so use extreme caution here. 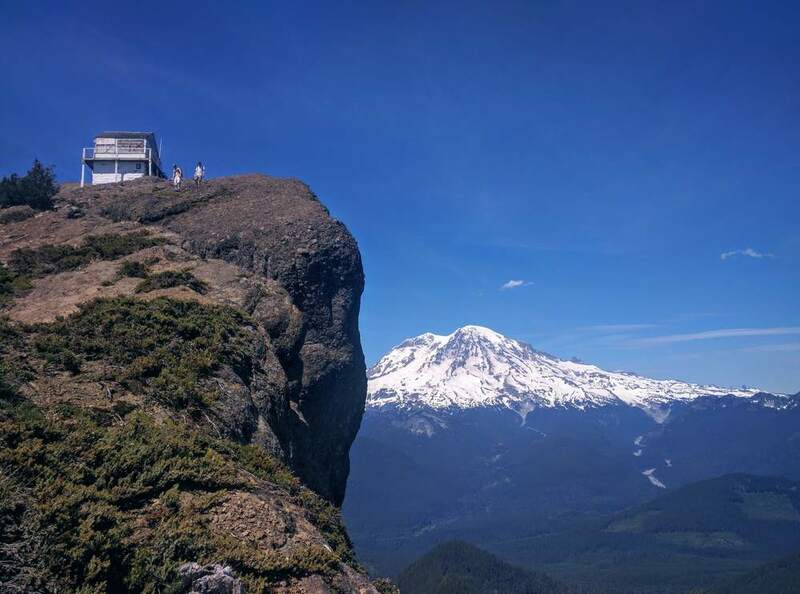 Besides the amazing views, the 1929 lookout is this hikes main attraction. 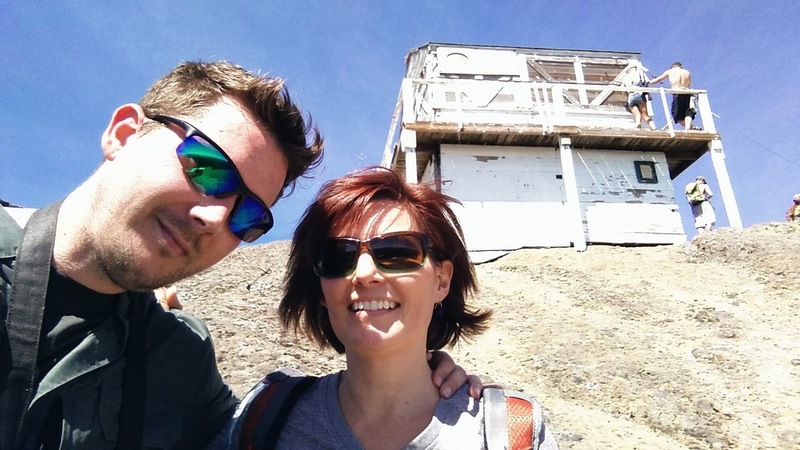 The windows of it were all boarded up, and a sign at the beginning of the trail said that it was closed for repairs, however, the door was open and we were able to walk inside it. We took a quick look in and were not surprised to see the walls covered in graffiti. Not just inappropriate drawings and curse words - apparently Snapchat is the new in thing these days, there were a handful of its usernames written on the walls. On the bottom of the building's south side is a plaque indicating that the site is listed on the National Historic Lookout Register. The lookout provides a balcony that wraps around all but the north side. On the north is more rock, which you're able to traverse in order to get around the rest of the structure. According to the link above in this paragraph, it's a 1,200' drop off this portion of rock (insert OMG face here)! Our visit up here was shared with ~20 others. Most taking in the views while shooting photos; others eating lunch; and some stretched out on the upper ridge sunbathing. 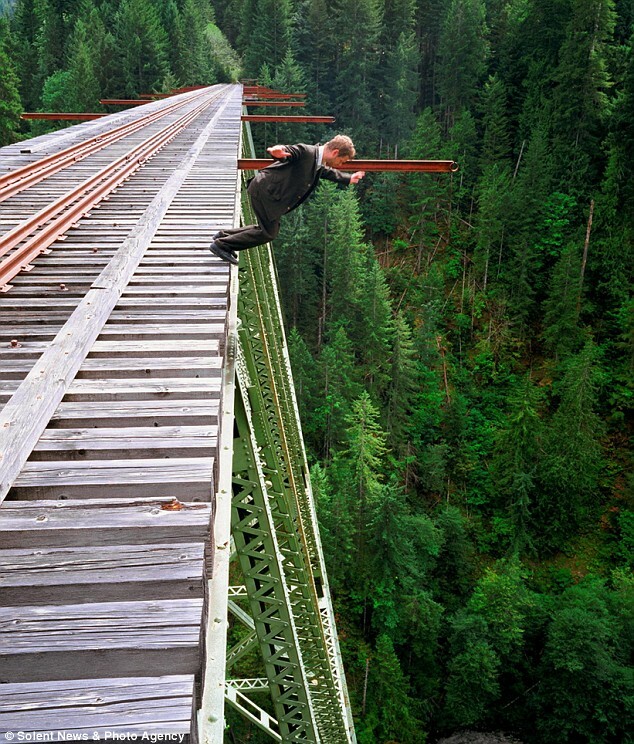 All were in good spirits and behaving well, no daredevils trying to show off like the few at Vance Creek Bridge, particularly this guy. The hike back was quick and easy. Gravity is your friend, if your knees are in good shape. We only stopped to take pictures of the many flowers we encountered. On this clear, hot day, the views were spectacular. In every direction, photo worthy scenery graced our line of sight. We had to put a bit of effort into making it to the top, but what a pay off! There were quite a few bugs swarming around, but none biting. It was a good day! 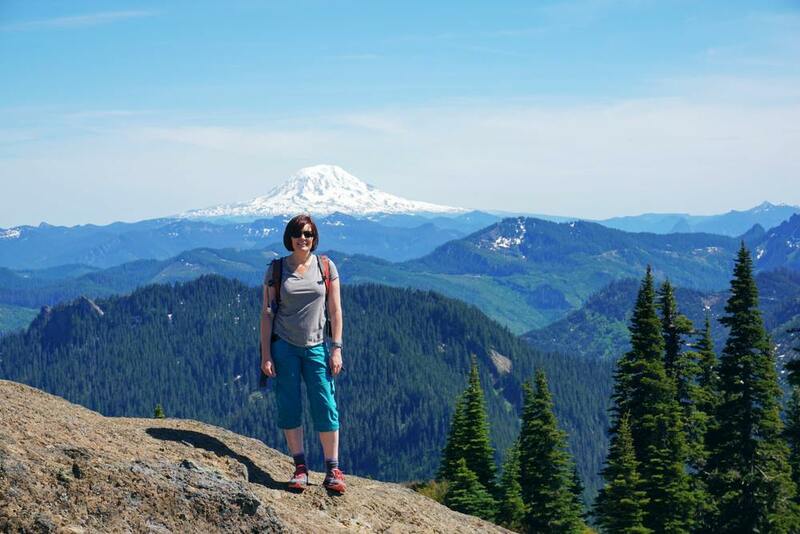 For the shorter distance this hike represents, you owe it to yourself to tackle this trail. This is a gem!